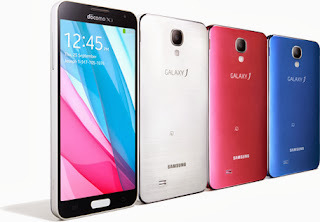 Samsung has released a new smartphone, The Samsung Galaxy J, in Japan and Taiwan and soon going to release in India. Samsung Galaxy J comes with a 5 inches Full HD IPS display with Corning Gorilla Glass 3 and a large 441 ppi pixel density.It is powered by the powerful 2.3 GHz Quad-core Qualcomm MSM8974 Snapdragon 800 processor and it has Adreno 330 Graphics Processing unit with a large 3GB RAM.The phone is loaded with connectivity features like high speed 3G, 4G, faster Wi-Fi with ac band, DLNA support, NFC, Infrared port and many more.It has 13 Megapixel front camera with flash, auto focus and 4K video recording and 2 Megapixel front camera for video calling.It has 2600 mAh Li-Ion removable battery. The release date and price in India are yet to be announced by the company.Check out the complete Features and Specifications of Samusung Galaxy J.